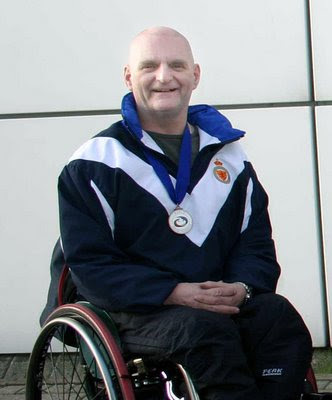 Team Great Britain skip Michael McCreadie was a notable absentee from the list of individual athletes selected to the British Wheelchair Curling Squad for Season 2010 - 2011. Gregor Ewan, Jim Gault and Michael McKenzie join recent team members Tom Killin, Rosemary Lenton, Angie Malone, Aileen Neilson and Jim Sellar. There was no mention whether Tom Pendreigh remains as coach. Bob Cowan reports Michael saying, "I have decided to take a season out of international competition and re-assess next season." Expectations of success are as high in Scotland as in Canada. Michael was unable to repeat, as leader of the generously sponsored program, the success he enjoyed as vice to Frank Duffy, and admits the pressure of the past couple of years affected his enjoyment of the sport. Read Bob's report HERE. A great loss to Team Scotland and just a wonderful, wonderful person. Michael will be missed on the International W/C curling circuit. Enjoy your break Michael and we hope to see you back on the curling scene soon. Great guy, he will be miss.